For most foods, presentation is everything. So blending elegant styling, with superb merchandising flexibility and craftsmanship will help generate the best profits! 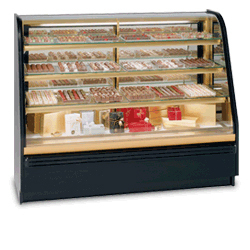 Federal Industries’ Climate-Controlled Confectionery Displays achieve this goal. The cases are available in lengths of 4′, 5′ and 6′, and are designed for continuous case lineups. Choice of six standard laminates on base. Other finishes are optional. Reflective sliding rear doors with lock. Climate controlled rear storage area with lock. Three tiers of adjustable glass shelves. Customer adjustable temperature and humidity controls balance case environment to prevent discoloration, dehydration and loss of gloss.